NOTE: This is NOT a pricing error- it is actually cheaper to buy the Hurt Locker Bundle of 3 [Three] - we simply cannot afford to have our cases emptied of just Brutus at retail. 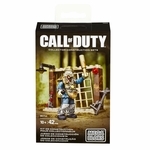 CNC66 – Mega Bloks Call of Duty – Brutus Build the Call of Duty Brutus collector construction set by Mega Bloks. Chained, yet uncontained, the prison bars cannot hold back the onslaught of Brutus. The highly detailed prison is fully buildable, but it’s no challenge for its inmate. Brutus is a Zombie micro action figure with bone chilling detail. He’s equipped with detachable armor and a prison guard club. Sound the alarm and don’t let this one escape!